Nicholas Eames took the fantasy world by storm with his stellar debut KINGS OF THE WYLD (US | UK | AUS) about a band of mercenaries getting back together for one last impossible mission. 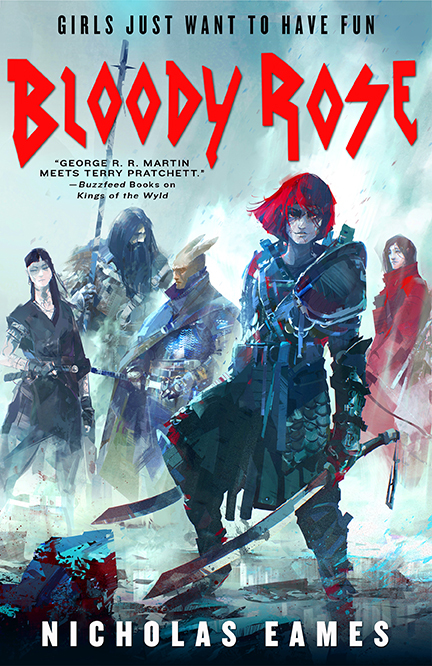 Now, we’re excited to reveal the stunning cover to his follow up, BLOODY ROSE where he’s introducing us to a brand new band. Art by Richard Anderson, cover design by Lisa Marie Pompilio. Tam Hashford has always dreamed of living through glory days of her own. With a renowned mercenary for a mother and an illustrious bard for a father, battles and adventure seem the only way to really live. So when she learns that the most revered mercenary crew in Grandual is in need of a bard, she grabs her lute and goes on tour. Led by the infamous Bloody Rose, Tam and her new band embark on a mission that will earn them everlasting fame — or certain death. KINGS OF THE WYLD is also up for the Best Fantasy award in the Goodreads Choice Awards. Congratulations, Nicholas Eames!